IMAGINE CRAFT - Eureka Concepts - How good is that?! ​Australian designed APP Smart Craft kits for kids. 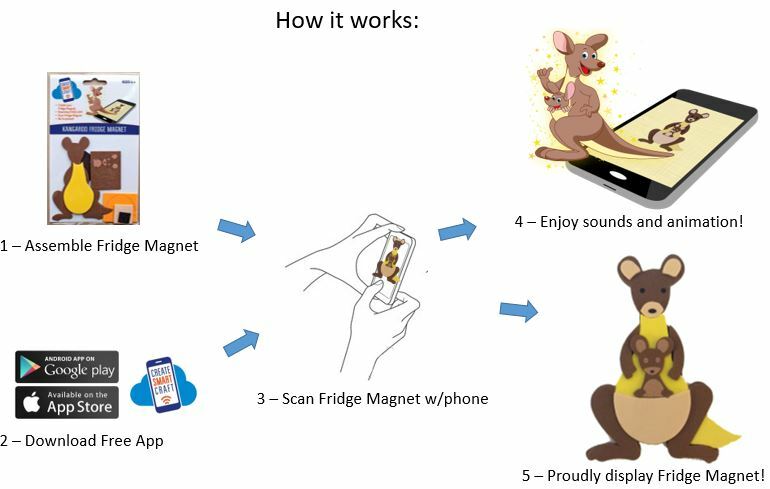 Imagine Craft fridge magnets are the brain children of Australian inventor and entrepreneur Tracy Miles. They combine an easy but rewarding craft activity with the fun of a free App that adds extra content and enjoyment to the end product. Once completed, the fridge magnet can be proudly displayed on the family fridge. There are two ranges: FUN and AUSTRALIANA. The free App works on Apple devices as well as Android. Also, the App does NOT require any further in-app purchases so your little ones won't be spending any more money with their fridge magnet. RETAIL INQUIRIES, please email us by clicking here.